Designed specifically for driving high-capacity, aftermarket in-tank Low Pressure Fuel Pumps (LPFPs), such as Walbro F90000267 (450) or DeatschWerks/Bosch DW400. Plug-n-Play replacement for the factory Volkswagen/Audi Fuel Pump Control Module Part No 5Q0 906 093. Eliminates diagnostic trouble codes (DTCs). Fully configurable with easy to use TorqVFM PC software, which provides live-viewing, data-logging and playback of ECU-commanded vs. Pump-actual duty helping to diagnose fuel system or ECU tuning issues. The first and only proper MQB LPFP upgrade system on the market that allows the ECU to perform complete closed-loop control of the requested fuel system pressure regardless of what aftermarket pump is installed. The ability to use any aftermarket LPFP, while keeping the ECU in complete control of its operation, is a key distinguishing feature not available with any other competing solution. Eliminates the need for ECU LPFP "mapping", which artificially keeps the LPFP peak current draw just below the 17A shutdown threshold of the factory fuel pump controller. Supports, big turbo setups by removing the traditional LPFP fueling bottleneck and permitting the fuel system to hold any ECU-requested pressure. A truly scalable solution. A single PM3 can supply up to 36A of output current to the LPFP or multiple PM3s can be installed in parallel to drive banks of high-capacity pumps (e.g. in setups using external surge tanks). Regardless of the preferred fuel system configuration, the ECU tuning stays in complete control of the low pressure fuel system's operation. Works with any LPFP model that draws less than 36A at peak load and peak duty. With the PM3 you are not sacrificing future flexibility and limiting your options by using a fueling solution that only lets you use one particular LPFP make/model. Works with any ECU tuning package, or even without any ECU tuning at all. With a PM3 you are not sacrificing future flexibility and limiting your options by using a fueling solution that forces you to use only one vendor's ECU tuning suite. Compatible with voltage boosting modules and new high-voltage pumps rated for up to 20V. Integrates seamlessly with the vehicle's factory electrical system. Included Plug-n-Play harness transfers maximum power to the pumps using thick 10AWG (5.0mm^2) automotive TXL wires. Overdesigned using the highest-quality automotive and industrial grade electronic components that far exceed the operating ratings and endurance of the vehicle's OEM electronic modules. Designed, built and tested in Canada. Torqbyte PM3 is an advanced fuel pump driver module designed to overcome the challenges of increased fueling in returnless fuel injection systems where the ECU and the factory fuel pump control module (FPCM) perform closed loop control of the fuel system line pressure. 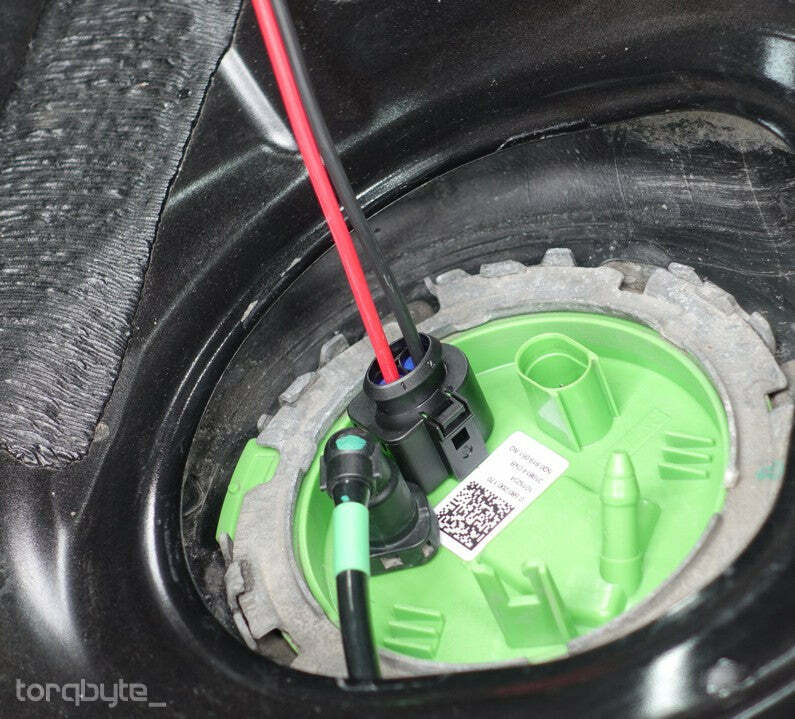 In the factory configuration, the stock FPCM is only able to drive the in-tank fuel pumps the vehicle was originally equipped with. The PM3 has been a reliable workhorse in numerous high-horsepower VAG applications since its introduction. This latest kit allows the owners of MQB platform vehicles to realize the same LPFP upgrade benefits that the owners of previous generations of PM3-equipped VW and Audi vehicles have enjoyed for years. Higher capacity aftermarket in-tank fuel pumps often draw more current than the factory LPFP control module is able to supply. Such aftermarket pumps can overload the factory FPCM and cause it to overheat. This overloading and overheating results in intermittent pump operation which causes a drop in fuel line pressure thus defeating the whole idea behind running upgraded fuel pumps. Torqbyte PM3 provides the best and most effective solution to this problem. This kit installs between the ECU and the upgraded LPFP to enable the factory system to operate as intended with greatly increased current handling capacity. PM3 is capable of continuously supplying the aftermarket LPFP with up to 36A of current. While the PM3 does all the heavy lifting in terms of supplying the required additional current to the aftermarket LPFP, the J538x module interfaces with the ECU and generates the same PWM control signal as the factory FPCM. Torqbyte's innovative technical solution implemented within the PM3 and J538x allows the ECU to maintain full control of the aftermarket fuel system operation and maintain the closed-loop fuel pressure control mechanism the vehicle was originally designed with. This key distinguishing feature is something that _none_ of the other fuel control "upgrades" currently on the market are able to offer. The supplied Plug-n-Play harness is designed to eliminate cutting, splicing or disturbing the factory electrical wiring. It inserts in-line with all the factory wiring. The Plug-n-Play adapter uses OEM VAG connectors with proper silicone wire seals and properly-crimped contact terminals. All wire is SAE J1127 TXL automotive wire. In order to minimize line losses and ensure maximum electrical power transfer to the fuel pump, the Torqbyte kit comes with a custom pump power wiring adapter with SAE J1127 10AWG (5.0mm^2) TXL automotive wire. PM3 is easy to install and comes equipped with a built-in 40A fuse. On the outside, Torqbyte PM3 is enclosed in a thermally-conductive, CNC machined aluminum enclosure that is hard anodized for maximum durability. 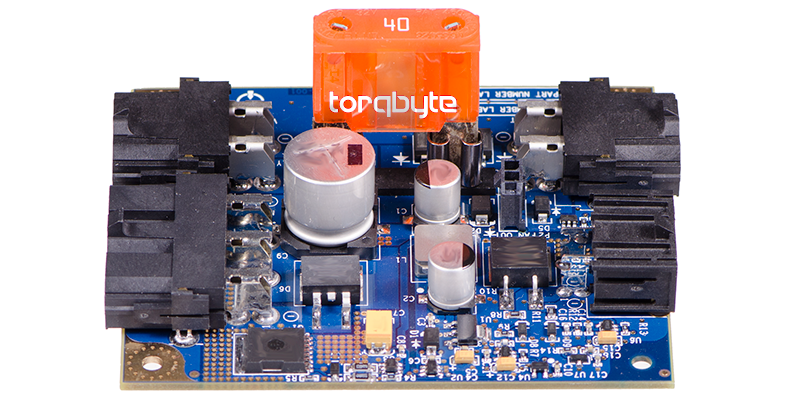 On the inside, Torqbyte PM3's electronics showcase our top two design goals: Quality and Reliability. PM3's design relies entirely on industrial-grade electronic components from the world's leading semiconductor companies including Texas Instruments, Analog Devices, Infineon Technologies, STMicroelectronics, ON Semiconductor and Vishay Intertechnology. 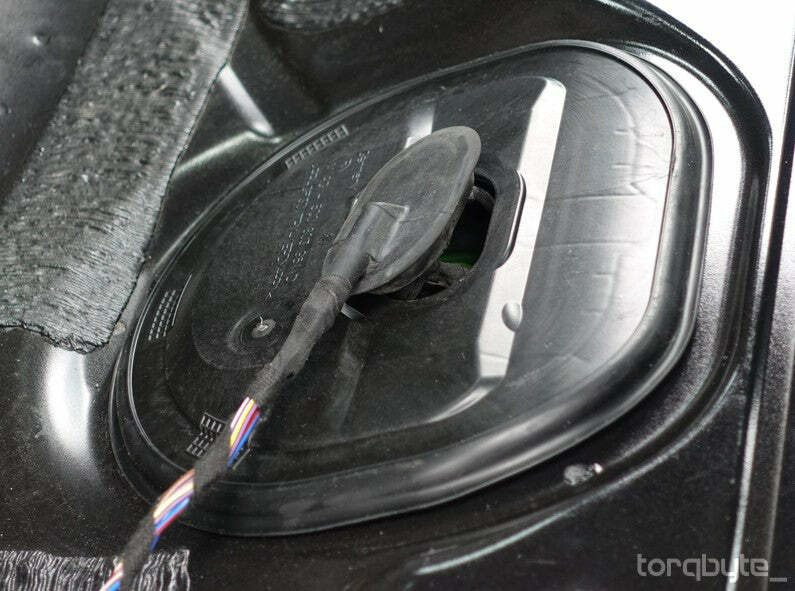 Torqbyte PM3 is supplied with SAE J1127 10AWG TXL automotive wire with annealed stranded copper conductors and premium-grade abrasion, chemical and moisture resistant, high temperature Crosslinked Polyethylene insulation. Note: The installation procedure shown below is only intended to show one possible installation approach and to highlight some of the key steps and pieces of hardware included on the kit. Other approaches are also possible and would be just as suitable. 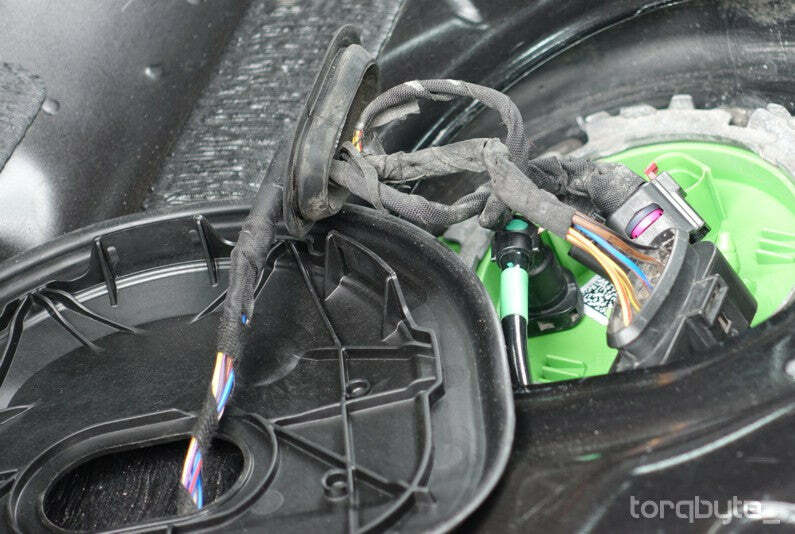 The vehicle used for this procedure was a 2015 Audi S3, which is an AWD vehicle with a 2 Pin pump connector. 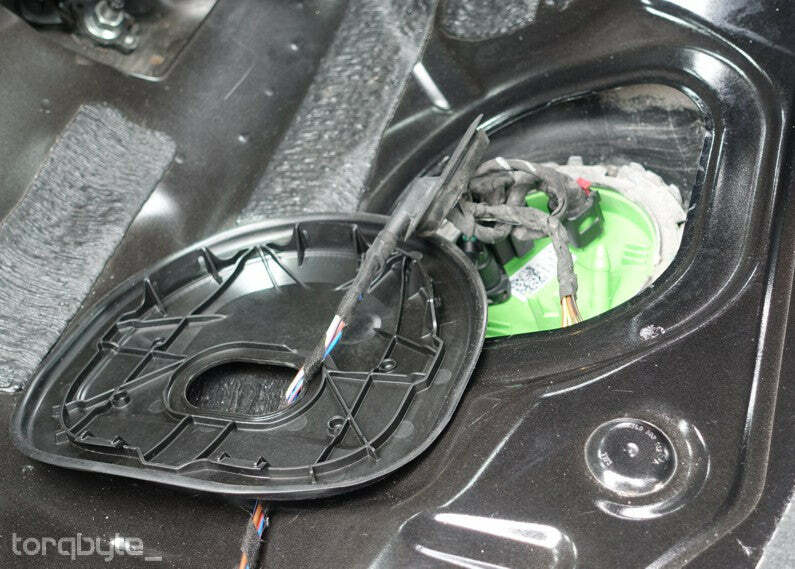 The procedure is nearly identical on FWD vehicles with a 5 Pin pump connector. 1. 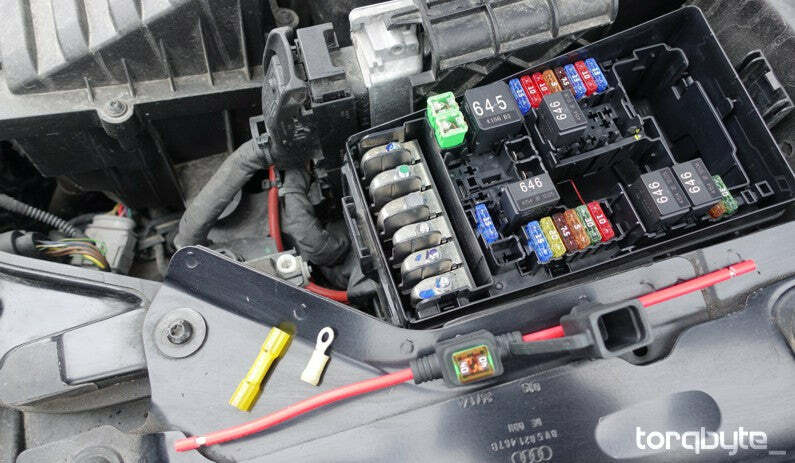 Disconnect the battery before doing any electrical work on the vehicle. 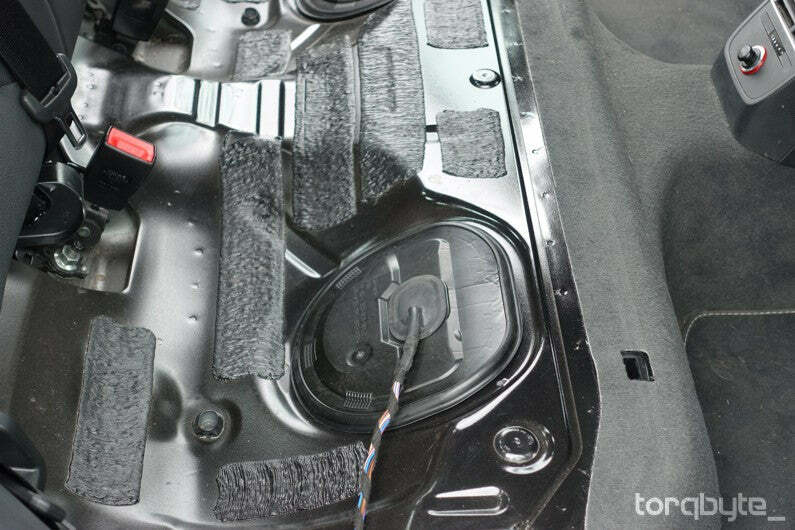 Remove the rear seat to access the fuel sender cover. 3. 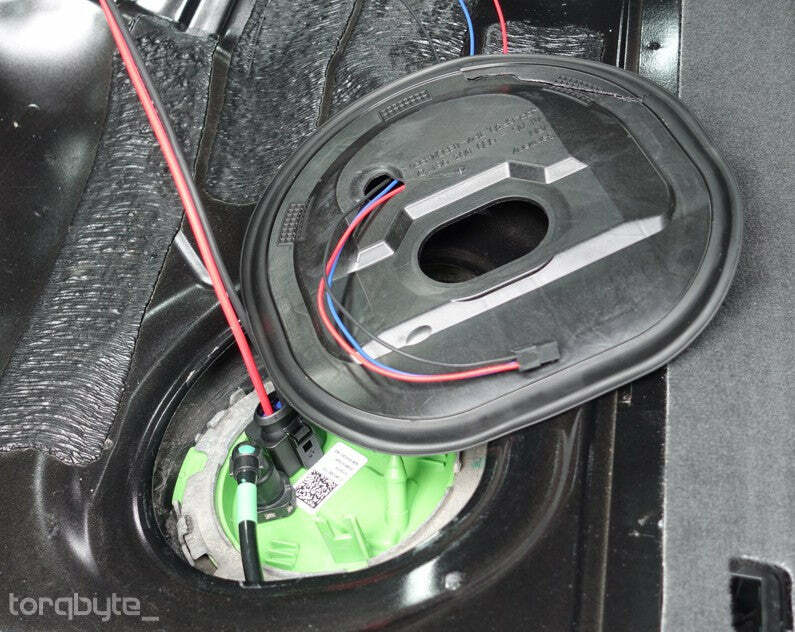 Push the rubber grommet through the cover and flip the cover over to access the fuel sender connections. 4. 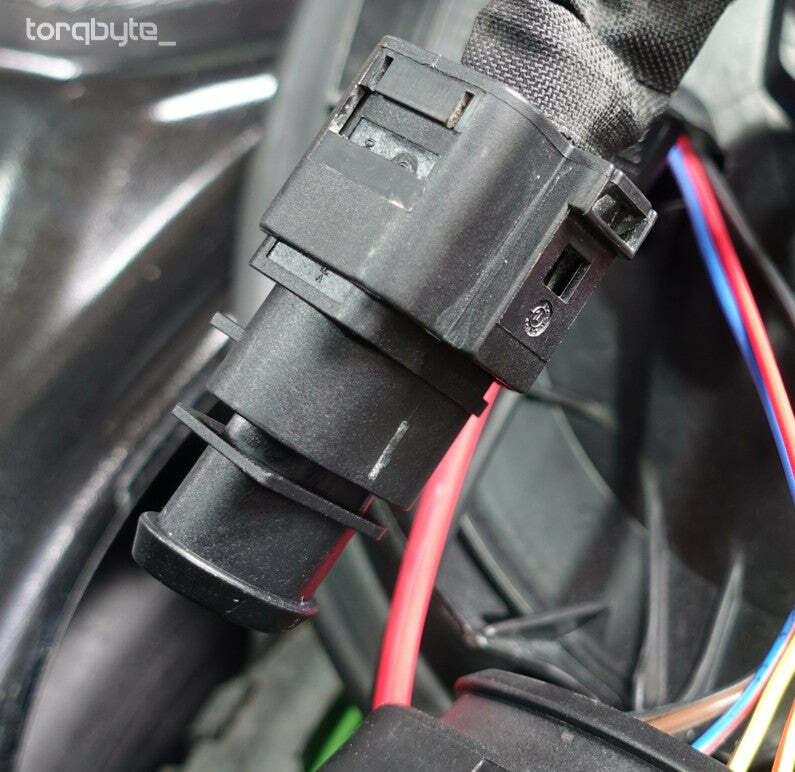 Release the Fuel Pump Control Module (FPCM) from its holder. This can be frustrating, but there is a single tank at the top that has to be pushed up and this will release the module. Pull the module out and disconnect it from the wiring harness. Clean the module and set it aside. It will be relocated inside the vehicle later on. 5. Pull the remaining connectors through the cover to free the cover. 6. Drill a 12mm hole (15/32") in the cover. We recommend the location shown below. Some people prefer not to drill the cover, but to pass the required wiring through a small incision in the large rubber grommet. 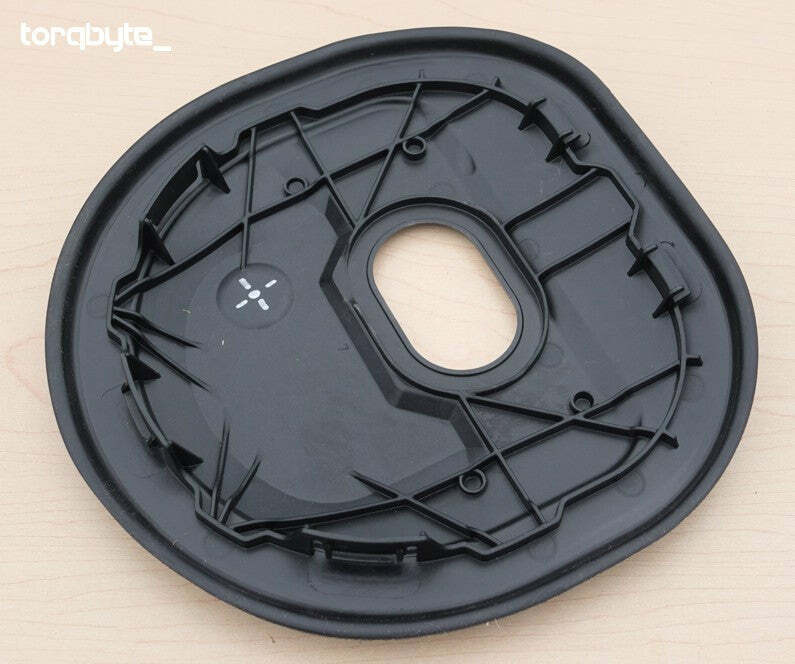 If going with the rubber grommet option, the incision should be made in the flat part of the grommet and extreme care should be taken not to damage the factory wiring that already passes through the grommet. 7. Assuming the aftermarket LPFP is already properly installed in the fuel sender basket, attach the supplied 10AWG pump power wire adapter. Ensure the connector lock is properly engaged. 8. 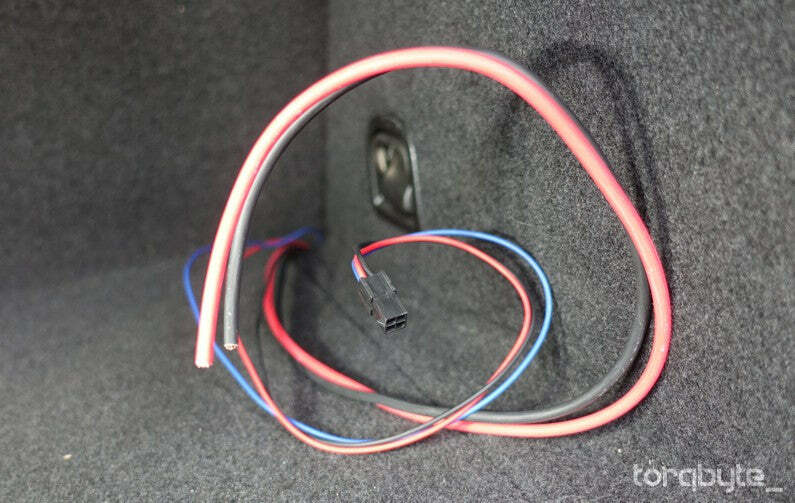 Pass the square black 4-Pin connector with three thin wires (Red, Black and Blue) through the cover so that the small connector goes towards the interior of the vehicle. If drilling a hole, try to do a nicer job than our techs did in the photo below. 9. 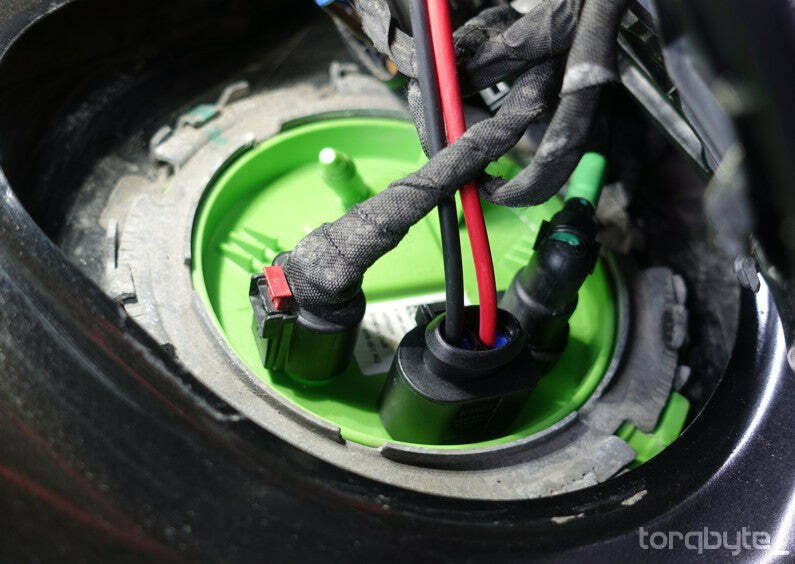 Pass the unterminated ends of the 10AWG pump power wire adapter through the same hole (or through the inscision in the grommet if you opted for that approach) so they also go towards the interior of the vehicle. 10. Roughly place the large 5-Pin male D-connector in position as shown. This connector will mate with the large 5-Pin female D-connector that used to be attached to the (now removed) fuel pump control module. 11. Bring all the factory connectors back through the cover. 12. Mate the new large 5-Pin male D-connector with the factory large 5-Pin female D-connector as shown. Ensure the connector lock is properly engaged. 13. 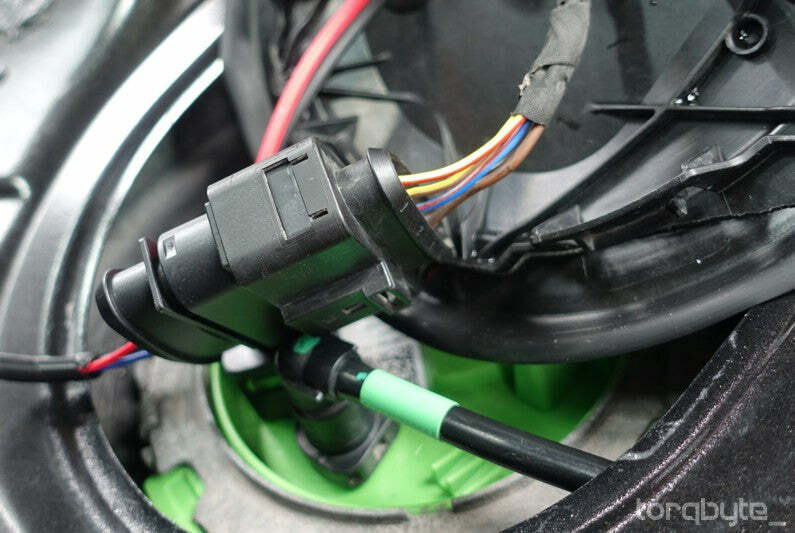 The factory 2-Pin fuel pump power wire D-connector is no longer needed. Mate it with the supplied blind plug that will protect it from the elements. Ensure the connector lock is properly engaged. 14. Reconnect the fuel level D-connector. Ensure the connector lock is properly engaged. 15. Cleanly tuck everything under the cover. Ensure nothing is loose or rubbing against a sharp metal edge. Snap the cover back into place and try not to crack it the way our techs did. Run the new wiring neatly alongside the existing wiring. 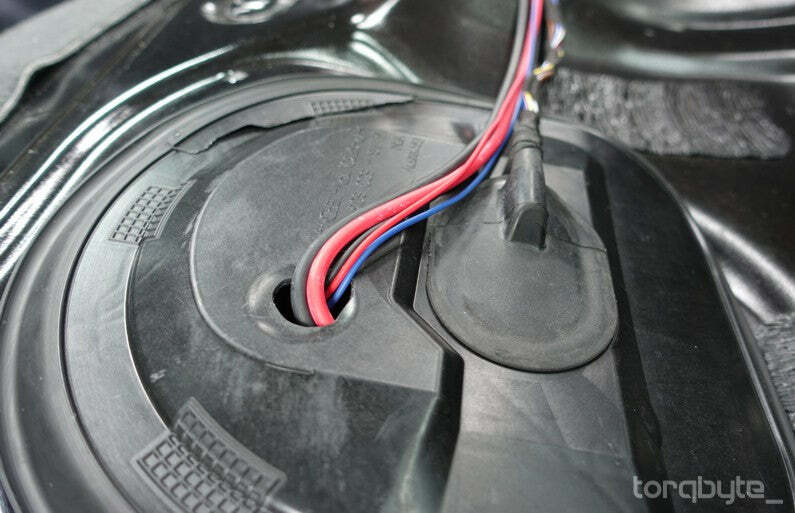 You can tie the new wiring to the existing wiring using harness lacing or you can use protective wire loom. Seal the hole previously made in the cover if you used this approach instead of the grommet incision. 16. Neatly run the wiring under the plastic panels and under carpeting under the backrest of the rear seat until it exits in the trunk area. 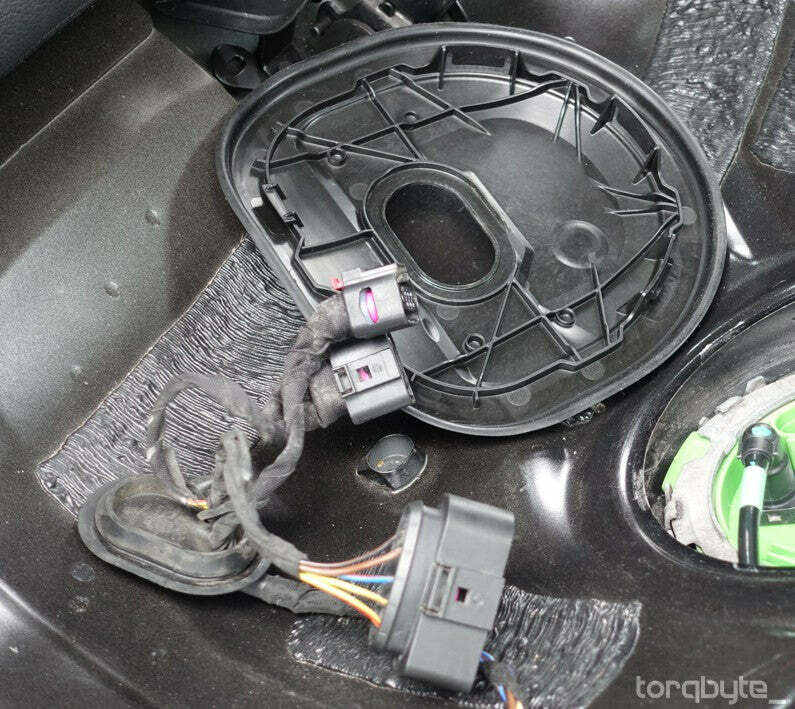 Ensure the wires are routed such that the folding action of the rear seat will not crush the wires or pull on them if the seat is ever folded down in the future. 17. Locate the short 4 to 12 pin adapter and the included J538x module. 18. Mate the adapter with the J538x module and ensure the connector locking tab is properly engaged. 19. You can rotate the PM3 and the J538x on the supplied machined holder however best suits your planned mounting, but ensure the 6-pin connector on the J538x and the 2-pin Control In connector on the PM3 end up facing the same way. 20.Attach the J538x module to the machined bracket using its rear 3M VHB tape pad. Ensure the bracket is clean, peel off the red backing and apply even pressure to ensure good adhesion. You should now have a one-piece assembly that you can mount in the trunk area. 21. Install the supplied 2-wire adapter between the 6-pin connector on the J538x module and the PM3's Control In connector. Ensure both locking tabs are properly engaged. 22. 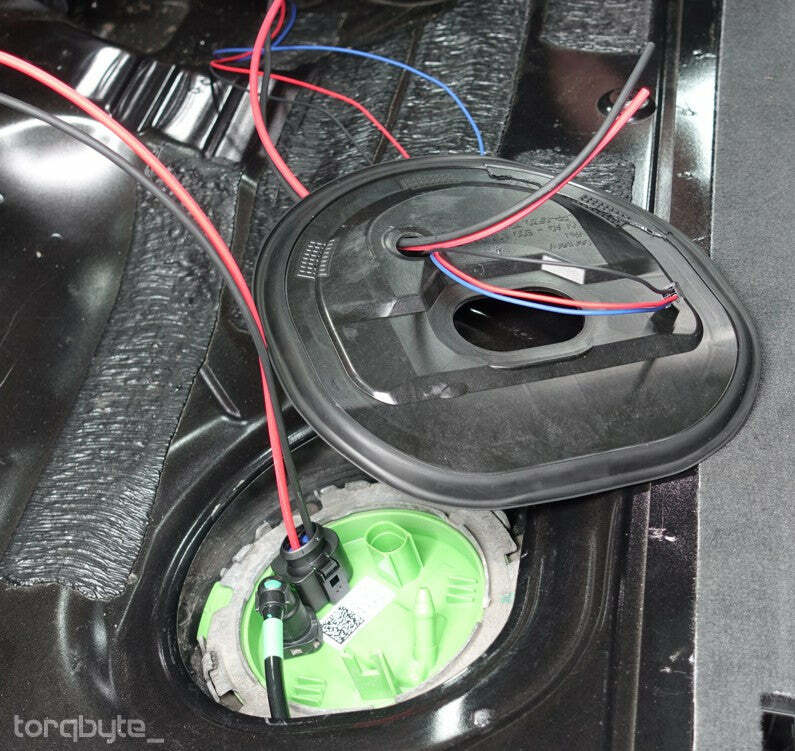 When selecting the mounting location, ensure it's out of the way and high up enough that items sliding around in the trunk will not impact and cause damage to the modules, especially the orange fuse that protrudes from the PM3. In this example we opted for installing everything at the top of a vertical carpeted panel on the passenger-side of the vehicle almost near the top of the trunk. 23. Mate the two 4-Pin connectors together as shown and ensure the connector locking tab is properly engaged. 24. Using the two supplied yellow wire splices connect the PM3's Pump Out connector adapter to the two 10AWG pump power wires. Red to Red and Black to Black. 25. Carefully review the Power and Grounding notes HERE and find a suitable vehicle grounding point preferably near the trunk area. 26. Terminate the ground (BLACK / Negative) wire on the PM3's Power IN connector using the supplied M6 ring lug. Note: You will need to extend the supplied pigtail to reach one of the factory grounding locations using the supplied yellow splice. You MUST use 10AWG wires to make the extension. 27. Connect the crimped ground ring to one of the factory grounding locations. There are several factory grounding locations in the rear of the vehicle. 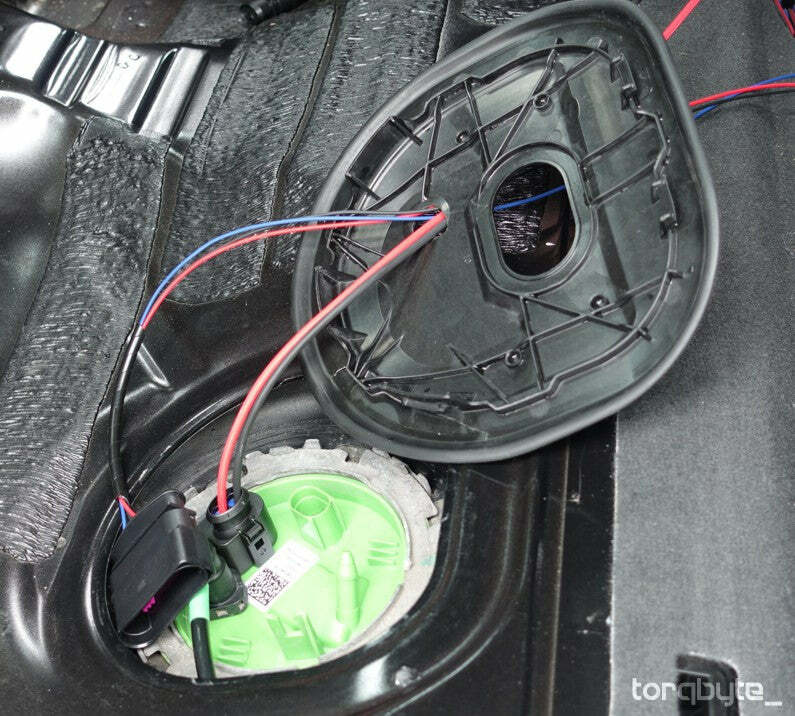 These are the grounding locations in a 2015 Audi S3. 28. 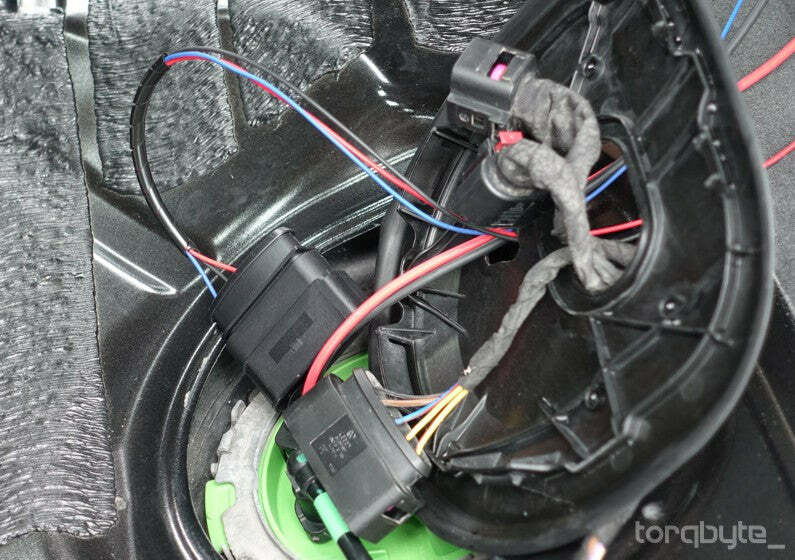 PM3's (RED / Positive) Power wire should be extended towards to the fuse box in the engine bay. Note: You MUST use 10AWG wires and the supplied yellow splice to make the extension. 29. Use the supplied 40A fuse and fuseholder with an M5 lug right at the factory fuse box power entry block. 30. Check everything over 3 times and ensure all the sealed splices have been heatshrunk. 31. Plug the Power In and Pump Out connectors into the PM3. 32. Reconnect the battery and clear any codes that may have been set as modules were connected and disconnected. The supplied J538x module is shipped fully programmed from the factory with a calibration that fully emulates the OEM fuel pump control module. This means that users can install and use the kit as shipped without the need for any software set-up, programming and calibration. However, J538x module is a fully programmable controller and allows users to utilize some of its advanced features such as live-viewing, data logging and slope adaptation via the built-in USB connection and our free TorqVFM software. Dimensions 5.0" x 3.5" x 1.25"